In the early 1900s, if someone was sick, they went to the local doctor. In some cases, the doctor made house calls and often was the gatekeeper for that person’s medical needs. With the growth of medical insurance and other intermediary entities, primary care physicians (PCPs) began to see their role as gatekeeper being diminished due to numerous factors, including burdens related to filing insurance claims in a fee-for-service arrangement and the need to be within a broad medical network in order to have a patient pipeline. 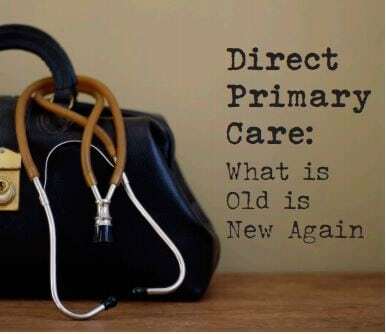 A small but growing trend is the rise of direct primary care (DPC) physicians, which alter the care model and financial model of healthcare in considerable ways. Instead of being in a medical network and receiving a payment for each procedure in a fee-for-service arrangement, these DPC doctors instead charge a monthly membership fee, usually between $50 and $100 per month, depending on the geographic market. In the traditional fee-for-service arrangement, the doctor had to stack their days full of appointments in order to drive revenue, largely at the expense of losing face-to-face interaction with each patient and creating a back-log for scheduling. In the DPC model however, the member receives access to routine checkups, same-day or next-day appointments and even a variety of medications and lab tests at or near wholesale prices. In some cases, depending on the DPC provider, you may even get after hours access to your doctor via video chat or phone call. In some employer- sponsored relationships, the PCP actually provides care at the worksite for enrolled members or makes house calls. All of these services are done via the monthly subscription fee with additional co-pays associated with care. All doctor- expenses are usually provided at wholesale with a markup, but significantly lower than what is paid in a fee-for-service model. This personalized touch is possible because patient loads at DPC practices tend to be between 500 patients to less than 1,000 patients per practice. Most fee-for-service PCPs who are in multiple commercial medical networks have patient load of over 2,000 patients. For employers sponsoring this form of benefit, there are a few areas that need to be properly addressed: while DPC is good for basic office visits and discount drugs, if an employee has a major medical issue, their expenses won’t be covered under this arrangement because DPC is not an insurance policy. When an employer adds a DPC option to a benefit plan, the employer must combine DPC with some form of traditional network or access to wrap around the DPC that covers larger ticket medical expenses and hospitalization coverage, alongside pharmacy benefits management for drugs that could not be distributed or administered at the primary care level. medications. Concierge medicine, while providing personalized attention, does however file in a fee-for-service manner with insurance unless otherwise specified. Avoid unnecessary costs related to specialty care; in some cases the employers cost and quality tools are used in concert with the DPC practice to help steer the member to doctors and facilities that create better healthcare purchasing value for larger ticket medical expenses outside of the scope of DPC. There are an estimated 1,000 DPC practices across the United States, with some models growing to create an affiliation or network of DPC doctors under one operational platform. To find a DPC practice near you, visit DPCFrontier.com and review their interactive map for options in your area.